A little throwback sound on this one. 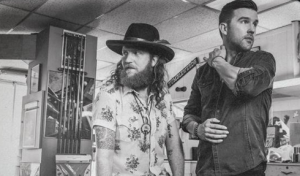 Brothers Osborne had their breakout hit last year with Stay A Little Longer. That hit is still on the top of the charts and could possibly become a number one. Whatever the final position, it’s been a major song for the guys and now comes the time to build on that. Here is a new song they just put out. Will it become another hit? This is a love song in a sense. My understanding is that it’s a love song to a lifestyle or to a passion in life. In this context I think the guys are singing about their passion for playing music. In the past that seeming passion might have been drinking. That’s a seeming love for many people, but the guys here discover that the kind of love you find in a bottle can let you down in different ways. And the drink often won’t love you back. But when you’re passionate about something or about someone that does love you back it really makes life worth living and much more enjoyable. A couple final things on this one. It’s totally different from what you hear on country radio right now. It’s a throwback, but it also sounds fresh. I like this style of music. It’s a little Hank Williams Jr. and a little Waylon. And anytime you have Lee Ann Womack singing background you’re going to have a really cool song. She nails her part and adds some cool depth to this one.